My hope is that RASopathy research will find a way for Gloria’s body systems to function better. She has profound challenges in many areas of her life. She cannot eat by mouth, sleep through the night, stand, or walk. She suffers from cyclical vomiting syndrome and is in need of suction frequently. 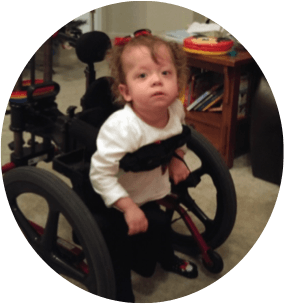 Many of these challenges stem from the infantile spasm seizures she had when she was 4.5 months old, which are common for children with CFC syndrome. 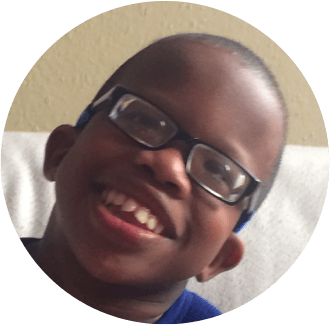 Prior to the infantile spasms seizures Glo could eat, and had some challenges, but she was able to function well and was cognitively developing normally. My goal for RASopathy research would be to fund the research to help find a MEK inhibitor that will allow Gloria to function better. It is exceedingly frustrating to know that there are potential treatments that could ease her suffering, but they are not being pursued presently for many reasons (all of which can and must be overcome). Beyond those issues the greatest fear that I have discussed at length with others in our community is the looming threat of the return of seizures that could rob Gloria of more of her quality of life, or even her life itself. This research is imperative, and the potential that lies in the discoveries of gene editing techniques like CRISPR CAS9 give hope where there was little before. Please support us in the cause of finding treatments and ultimately cures for children suffering from Rasopathies. This is my second daughter, Lilinoe. She is non-verbal, hearing-impaired, and is significantly cognitively impaired. She also has many of the health issues associated with her syndrome, including the dry, scaly skin, eating problems at birth, and cardiomyopathy. She needs assistance with almost all aspects of her daily life, and though she does learn very slowly, she will never be independent. 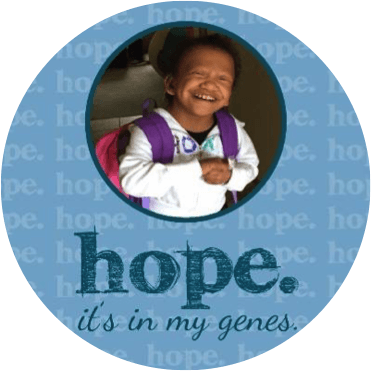 My hope for RASopathies research is to not only to extend her quantity of life, but to improve her quality of life as well. So that the multitudes of doctors appointments and procedures would lessen, because she wouldn’t need them anymore. I would like her to be able to communicate better with us, so she can tell us not only when something is wrong, but when something good happened. Or even just to say, “I love you, Mommy.” I would also like her independence to increase, so that one day if my husband and I are no longer able to take care of her, she won’t be a burden to my older daughter. These are my hopes for my daughter, my rare baby. Arthur’s development is at a 5-month-old’s level. We don’t know if he’ll ever walk or talk. We know he will be cognitively impaired, but we don’t know yet how severely. He might develop epilepsy and a serious heart condition. What we hope the RASopathies research will do for us is give us a tiny glimpse of hope for the future. We want to believe that one day there will be a way to “normalize” Arthur’s life as much as possible, so he can enjoy all this world has to offer like his typically developing peers, so that we stop worrying if the society will take care of him once we are gone, so that his brother can experience what it’s like to have a “non-special” sibling like the rest of his friends. 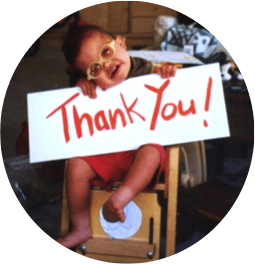 We hope that RASopathies Network uses all of its available resources to advocate for continued (and speedy) research in developing MEK inhibitors and CRISPR Cas 9 – and any other new technologies that we might not be aware of – that might work for our children, hopefully, in our lifetime. 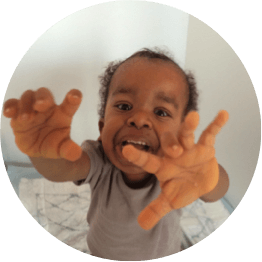 I hope RASopathies research will figure out ways to prevent people with Costello syndrome from struggling to eat food orally in those first years (or longer). I hope there will be a cure for vomiting so that people like my son do not vomit many times a day for the first few years of their life. I hope treatments are discovered (like taking a cocktail of vitamins) that will give our children muscle strength to help them walk sooner than age 3-5. I would love for a cure to be found for everything that people with Costello syndrome encounter such as increased incidence of cancer, orthopedic issues like scoliosis, kyphosis, and hip dysplasia, endocrine issues like hypoglycemia or growth hormone deficiency, and neurological issues like Chiari malformations and tethered spinal cord. 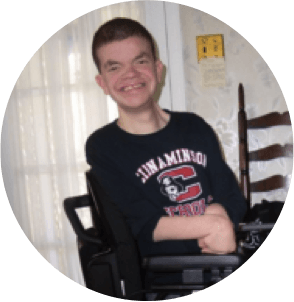 I hope someday that people with Costello syndrome do not have to struggle with day-to-day activities and spend years of their life in hospitals or PT/OT/ST therapy sessions. Anything that would contribute to a good quality of life. I do get amazed at the things/knowledge/advances the younger crowd has access to. My wish list would also include a GI and ortho magic wand. Provide answers and potential drugs to treat and prevent multiple diseases the CS population endures! 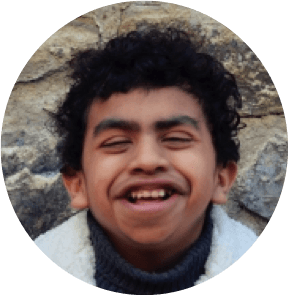 I wish the research could help my son to have better cognitive and expressive language abilities in order for him to live with more independence and freedom. I believe that if RASopathies research could look into what causes the metabolic abnormalities, lack of energy and/or muscle tissue, perhaps appropriate measures can be taken to cure or prevent many medical issues related to the CFC syndrome. 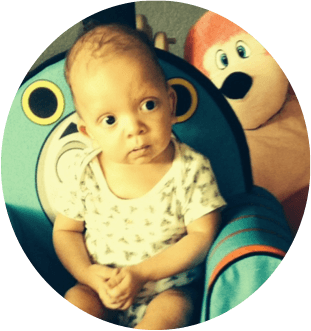 When Bracey was in the womb I was told my son was not swallowing properly, causing excessive amniotic fluid, and hospitalization starting four months before my due date. 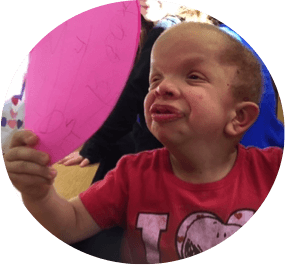 Without any indication of foreseen health issues, Bracey was born at 32 weeks and had a 2 month stay in the NICU. While in the NICU, a geneticist was notified to clinically observe Bracey. Her findings led to us establish a close relationships with a team of doctors specializing in medical fields I had never heard of nor thought I would become so knowledgeable about. 5-1/2 years into our journey of the unknown, Bracey was diagnosed with CFC syndrome. Bracey’s had severe reflux issues, constant aspiration, reoccurring pneumonia & chronic ear infections all making it necessary for Nissen fundoplication and gastrostomy surgery. 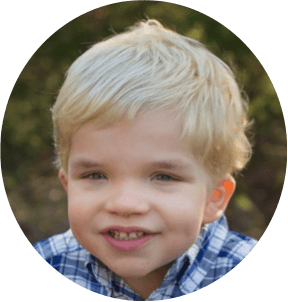 He also experiences ongoing seizure activity, painful reappearing dermatology issues, deteriorating vision, orthopedic & growth concerns, all the common features of low muscle tone, creating feeding, communication, and severe developmental delays. My wish is for RASopahies research to find ways to properly identify and diagnose CFCS so a family can get help mentally, physically, emotionally, medically and financially immediately. Even if our little warrior has already gone, we still hope that RASopathies research finally finds the way to correct the DNA anomalies for all of the living and incoming people with a genetic mutation. So we hope that it will help to make all issues of their vital organs an old memory. We wish that one day they’ll know how to correct the dysfunction of the transmission within the cells, which is, I’m pretty sure, the source of so many troubles for them.